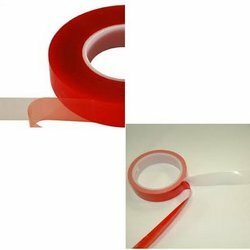 For our profound customers, we have introduced Very High Strength Clear Double Sided Tape to cater to the diversified needs of sealing & winding. These tapes contain polyester membrane coated with high coat weight acrylic adhesive system. These tapes exhibit very high initial grab, with good wetting out properties and for the reason, are asked prominently among users. Mainly used in print finishing, binding and sign making, offered tapes have very good UV stability and water proof nature. Looking for Very High Strength Clear Double sided Tape ?